Apple has released iOS 9.2 for compatible iPhone, iPad, and iPod touch devices. 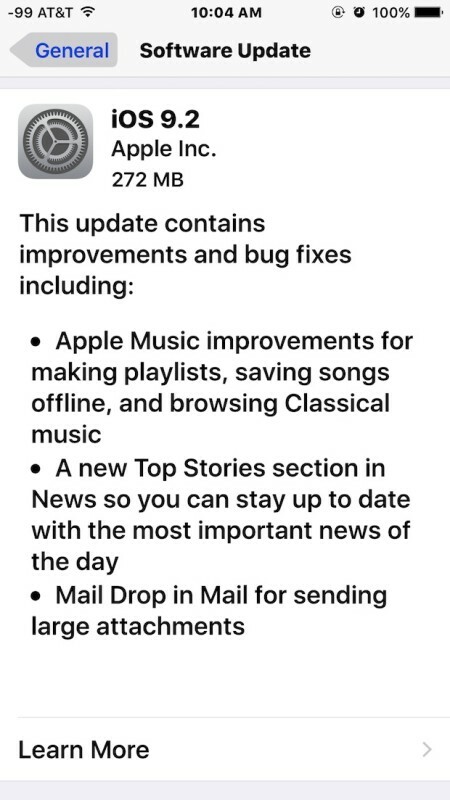 The latest version includes a variety of bug fixes and improvements to various iOS features, and also includes support for the MailDrop feature from the iOS Mail app. Complete release notes for iOS 9.2 and IPSW download links are available below. Agree to the terms and services (after thoroughly reading them, of course, good bed time reading), and the device will download and install the update, rebooting to complete the installation process. Users can also choose to download and install the update through iTunes by connecting the iPhone, iPad, or iPod touch to a computer with a USB cable. The video below walks through updating iOS on an iPhone using the Software Update mechanism on the device itself. Separately, Apple has also released OS X 10.11.2 El Capitan for Mac, WatchOS 2.1 for Apple Watch, and tvOS 9.1 for Apple TV 4th generation. For those wondering, iOS 9.2 offers no performance improvements at all. I updated my iPhone 6 Plus hoping for a miracle, but performance is just as bad as it has been since iOS 9 absolutely wrecked the speed of this thing. Very unfortunate. This thing is so slow it is hard to believe Apple sells it, and hard to believe Apple charges so much for it! I just upgraded my 64GB iPhone 6 Plus. It was so awful before- especially the App Switcher animations. I think they are somewhat better, but I KNOW the iPhone 6 models have sufficient hardware to play a TINY animation without so much stutter. Try it on the iPhone 5 and even the 4S. The 4S does a much better job then the 6 Plus. I hope it gets fixed. 2) do 100% backup of the iPhone to a Mac, including off-loading ALL your photos/vids, to the Photo app on the Mac. Then do a restore of the iPhone from the latest IPSW file, then restore ALL your content, from that latest backup. My iPhone 6 Plus is noticeably faster with iOS 9.2, less interface lag. It made no difference on the iPhone 6S Plus, which is quite fast. Still haven’t fix bugs that were in apps from Yosemite and it’s been over a year since I wasted my breath talking to Apple. Also took out features in El Capitan such as the new Disk Utility mess, sorting Notes by alpha order is gone, and Desktop Spaces no longer show what is in the thumbnail with a four finger swipe up like in Yosemite. AirDrop still doesn’t work properly. It takes forever, but it’s starting to look like never, to get certain bugs fixed or previous features restored. Dan what are the problems you have since I do not see any on mine, maybe I have not see it or pay attention. In fact mine fix some issues on some areas. I have been trying for over 6 hours! Got my new iPhone 6s yesterday and it did not give me a choice to not update during installation. :( :( :( grrrrrrr. galaxy…waiting waiting waiting. no updates….ever…LOL Samsung. It’s a lot smaller if you let the phone install the update itself rather than doing the install the hard, manual way. Updated both OS X and iOS to latest with absolutely NO issues today. iOS runs much faster now on an iPad Air. Whatever issues you got, are not Apple’s. Hi. I just wanna know if I update my iphone through the ipsw file through itunes, will it delete everything from my iphone or will it just upgrade like it would normally? Its just a waste of time to install apps and setup everything again. Need to know ASAP! Yeah, updating your iPhone by the IPSW file will delete everything stored on your device. You would wanna make a backup of your data before taking any steps further. If you select “Update” instead of “Restore” in iTunes, it will not erase your device, but OTA is still easier. BTW, those running the latest beta won’t be offered to update because their build was actually the GM. Downloading now, and I’m going to clean install, then restore personal content, and hopefully, those bugs will be a thing of the past. I updated and my iPhone 6 Plus is also still slow. I was hoping for a speed boost. Updated iPhone 5s and iPad without any problems. Pity still no search or way of indexing Notes, a major failure. I have my MacBook Pro enabled as a Wifi hotspot through my Time Warner cable setup. Having automatic updates turned on my iPhone 6S+, update was already installed before I read this article. Update my 5s and my iPad mini 2 took about 15 minutes, tops, and everything works fine. Not sure what y’alls problems are. My iPhone 6 Plus still denies manual iCloud Backups!!!! Great robert, update the iPhone! Thanks, do it, update your iPhone 5s, you’re welcome. Wasn’t this new version supposed to bring new wallpapers (yeah, I know, how shallow of me)? All I can find in there is the old collection, no new addition. If I update my iPod touch 5 will it delete my music my pictures and all my apps? ?